Hey! The radio was fun yesterday! 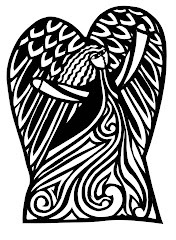 I was just absurdly nervous beforehand, but once I got there, in the studio with Cathy, (Melio, WERU-FM, http://www.weru.org, Off The Cuff show on Wednesday afternoons), I calmed down. Cathy is so warm and lovely. 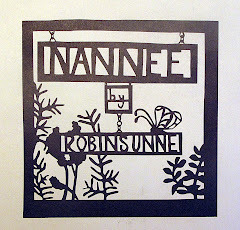 We chatted about ATC's at the library: http://www.rockport.lib.me.us/ArtistTradingCardsProject.php and about my new book, due out soon, which gives tips and lessons in Library ATC Swapping, info forthcoming at http://robinsunne.com and about my first book "Nannee" at http://robinsunne.etsy.com and I was delighted by the ohh's and ahh's that Cathy gave to my ATC's when she saw them. 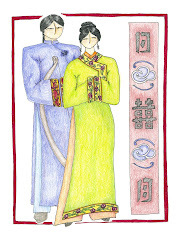 Now Cathy is an artist in her own right, one whose work I love, and so her ooh's mean something! Thank you Cathy for a great time! And then I came home and dinner had been prepared for me and my kids by a friend! Thank you Sue! I am enchanted. still. 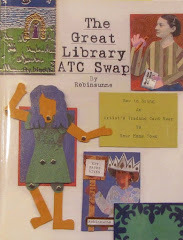 I thought that I would give you a peek at what I have been working on for the book: "The Great Library ATC Swap"... Eeps! Wrong picture - too many pixels. I will retake that and load it later today. Have a lovely morning. Back again in a bit.